I have seen several comments, blogs, questions, OTN forum posts, etc from people like me wanting to know how to run Oracle's PeopleSoft VM templates without OVM. If I had the hardware, I would love to run OVM templates directly, but I don't think it would be wise to reformat my Dell laptop as an OVM host. This post contains the steps I used to convert the FSCM FP2 PeopleTools 8.52.03 OVM template into a VirtualBox guest (currently running on my Dell XPS laptop). I started with the PeopleSoft Oracle Virtual Machine Templates Development and Customization Guide, which gave me some clues about the design of these OVM's. I'm typing all of this from memory, so let me know if I forget anything. PeopleSoft's OVM templates are split into two tiers (instances): A database tier and a generic tools tier. If you were to boot these images in OVM, the database tier would ask you a series of questions (SID, etc), and then configure the database based on your answers. The tools tier will perform a similar initialization to acquire database information and then will mount the database's PS_APP_HOME as well as create a PS_CFG_HOME, with app, batch, and web server instances. The "pairing" process includes updating Integration Broker and other host specific database settings. Download an OS. I chose OEL 5.2. You can download it from the Oracle Linux Software Delivery Cloud. In the Media Pack Search, select the Product Pack Oracle Linux and the Platform x86 64 bit. Select the DVD download. Download both a PeopleSoft DB and PeopleTools OVM template. These are also available on the Oracle Linux Software Delivery Cloud. In the Media Pack Search, select the Product Pack Oracle VM Templates and the Platform x86 64 bit. While constructing this example, I used PeopleSoft VM Templates for FSCM 9.1 Release Media Pack v3 for x86 (64 bit), which requires 5 total downloads. In the end, you should have one tgz file for the DB image, and one tgz file for the PeoleTools image. Untar and unzip the two tgz file (On Windows I use 7-Zip). Launch VirtualBox and create a new Guest OS with an OS type of Linux and a version of Oracle (64 bit). Set the memory to 2048 MB (2 GB of RAM). For the Virtual Hard Disk, choose "Create new hard disk." Walk through the new hard disk wizard. I chose a dynamically allocated disk of 20 GB, but the OS only required 8 GB. When the wizards finish, you will have a Guest definition. Open the guest's settings to insert a virtual DVD into the drive. Click on the Storage setting on the left. In the storage tree, select the CD icon to show the CD drive attributes. Click the little CD icon to the right of the "IDE Secondary Master" drop-down to select your OS's install media. In my case, this is the Enterprise-R5-U2-Server-x86_64-dvd.iso DVD image. Network adapters: if you know what you are doing, configure your network adapters. For the initial install, I kept one adapter with the default NAT. After install, I reconfigured my network adapters and I'll tell how I configured them in a few steps. Start your new guest and install OEL. You can accept most of the defaults. I turned off the firewall and set selinux to permissive. No, I don't recommend anyone do this, it was just the fastest way to get the image working. What you do about firewalls, etc is your responsibility. I then added myself to the admin group. Configure Yum to use the Oracle Public Yum server. Instructions are on the Oracle Public Yum site (Look for Oracle Linux 5). In your guest, open a terminal, become root (or use sudo) to run yum update. Install all available updates to get your system current. To resolve the issue, I copied the line from the VBox install output, yum install kernel-uek-devel-2.6.32-300.25.1.el5uek, and ran it. I then I re-ran ./VBoxLinuxAdditions.run to success. Shutdown your guest to configure more network adapters. 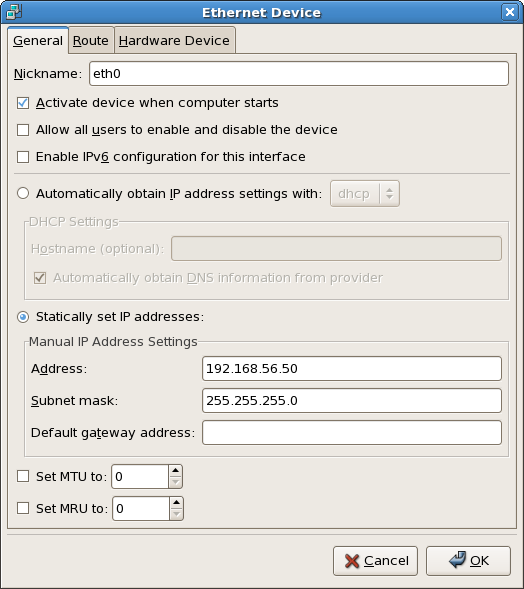 In the VM's network settings, set Network Interface 1 to Host Only. This is probably the easiest way to get your host and guest communicating over the network. Unfortunately, Host Only network adapters can't access the internet. To get internet access, add a second Network Interface for NAT. This will allow your VM to download updates, etc, over the internet. Start your VM and ensure that mouse capture, shared folders, etc are working. The oraclevm templates will call these functions to log/report information about the process. Note: we waited until now to create this file so we would have Guest Additions copy/paste. We are doing this prior to cloning so we will have this file in both the tools and db images. Create the following users and groups. Please pay careful attention to the uid and gid parameters below. I found these values in the /etc/passwd and /etc/group files from the OVM system image. You can use whatever uid and gid values you prefer, but changing them will require you to chown files. It is also important that psadm3 and appinst match between your database and tools image. Your tools image will nfs mount files owned by psadm3 and appinst. Please note that I did not configure any passwords for these users. If you want, you can set passwords. I just use sudo -u oracle -i. After creating your clones, move the vdi files you created earlier into the appropriate VM folder. For example, move oracle11g_x86_64_asm.vdi, System.vdi, and FSCMDB.vdi into the folder containing your Virtual Box DB guest files. Switch back to the VirtualBox Manager and open the settings for each of your 2 VM's. Add each of the vdi files to the appropriate guest's Storage SATA Controller. 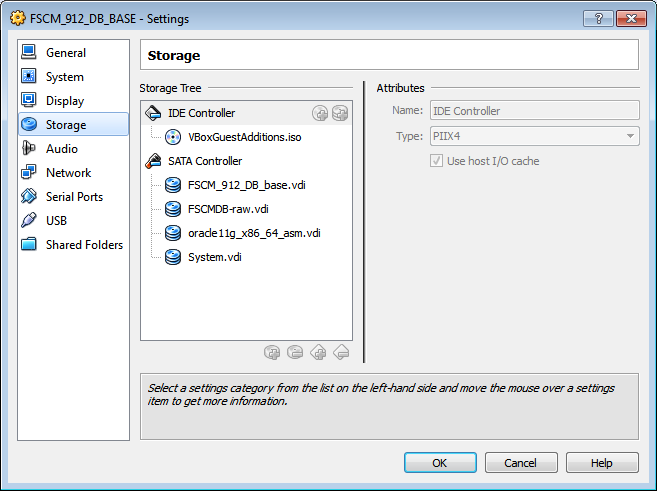 For example, in the DB Guest, add FSCMDB.vdi, oracle11g_x86_64_asm.vdi, System.vdi. System.vdi represents the boot/OS disk image used by OVM. We will use it to copy a few files, and then drop it. Boot the database image and log in. For a static IP on the host-only network do this: (Note: the benefit of having a static IP is that you don't have to update your hosts file every time your db IP address changes) Open a terminal and become root to execute the command (or sudo, which is what I do) ifconfig. Look for the IP address for eth0. In my configuration it is 192.168.56.101. Copy all but the 101 part (the first 3 segments). In the OEL menu bar, select System | Administration | Network. Highlight eth0 and click the Edit button in the toolbar. 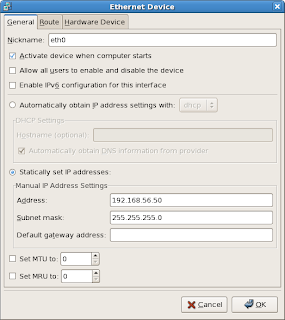 On the general tab, select the Statically set radio button and enter an IP address and subnet mask. For my network configuration, I chose 192.168.56.50 for my IP address and a subnet of 255.255.255.0. Click OK to close the edit dialog, and then choose File | Save from the menu bar. Using the buttons on the right, deactivate eth0 and then activate eth0. This will activate your static IP. Note: It will also mess up resolv.conf, so don't expect to get internet access until reboot (or reactivate eth1, etc). Create the following directories (as root or sudo). /dev/sda has 3 partitions, /dev/sdb has one partition, /dev/sdc has 3 partitions, and /dev/sdd has 3 partitions. To recap: /dev/sda is the primary OS/boot disk, /dev/sdb should be the database disk, /dev/sdc will have the $ORACLE_HOME, /dev/sdd is the original OVM OS disk. It is fine if yours are in a slightly different order. Just remember the order and change your mount points accordingly (or shutdown and reorder your SATA devices). See this handy tutorial for more information on adding swap. The db-reconfig.sh script expects to find oracleasmlib and oracleasm-`uname -r`. I was not able to find an oracleasmlib for my kernel (2.6.32-300.25.1.el5uek), and the test for oracleasm-`uname -r` seems a bit unnecessary since a different kernel version seems to be running just fine on my kernel (perhaps a test for the command oracleasm would have been more appropriate?). We will install as many of the dependencies as possible, and then comment out the rest. In fact, you could probably comment out the entire oracleasm section and skip these dependencies (I didn't try that, just went with the path of least resistance). Note: in steps 10 - 12, don't actually run db-reconfig.sh. The template script will call this script. We just need to make sure we take care of all the prerequisites. Install the following packages as root (or execute as sudo). Note, we won't really mount an ASM device, but the OVM scripts think one should exist. The template scripts will configure oracleasm, so you won't need to do that. If you are interested, though there is a nice tutorial here. Basically, you just need to run oracleasm configure and use the values specified in the tutorial. Open /u01/db-reconfig.sh and search for fail "oracleasm-`uname -r` not installed. It should be around line 400. Comment out that line by adding a # in front of it. Do the same a few lines later for fail "oracleasmlib not installed." And then further down, comment out the network configuration section (VBox takes care of network configuration for us). #    fail "oracleasm-`uname -r` not installed." ovm_info "oracleasm-`uname -r` not installed." #    fail "oracleasmlib not installed." # Somewhere around line 430? Note: I used the ovm_info macro we created earlier to print what the template intended to print, but without halting the script. Now for the big moment... As root (or run with sudo), cd into /opt/oracle/psft/vm and run ./oraclevm-template.sh. The script will ask you if you want to relink the binaries. Say yes. The next prompt will be for an Oracle SID (database name). Come up with one that is only 8 ASCII characters long. But if you see error messages before the prompt, type Ctrl-C now. This will end the script. First, resolve the errors, then rerun the script. When all is said and done, become user oracle. If you are root now, just type su - oracle. This will put you in your home directory. Type ll to see a long listing. You will see two new symbolic links: scripts and templates. Templates links back to the scripts we just ran. Scripts contains start/stop scripts, etc for the database. While here, review your .bash_profile (vim .bash_profile). 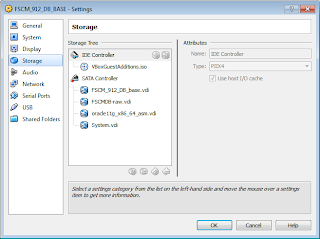 You will notice that the script inserted entries for ORACLE_BASE, ORACLE_HOME, etc. Edit the initXXX.ora script. I found the default db_domain property unsatisfactory for my configuration. If you don't want the db_domain, or it doesn't work for you, comment out the db_domain property. Copyright (c) 1991, 2008, Oracle. All rights reserved. Quit lsnrctl by typing quit. Service "FSCM912" has 1 instance(s). Service "FSCM912_XPT" has 1 instance(s). Service "XDB" has 1 instance(s). Copyright (c) 1982, 2008, Oracle. All rights reserved. The database tier contains application specific files that the tools tier will require (PS_APP_HOME). There are a handful of ways to make these files available. The way I chose was to use nfs. At a minimum, you have to share out a file. You can also configure hosts.allow and hosts.deny, but I just did the minimum. Make sure you take the appropriate security precautions when sharing out nfs folders. Since we defined a host here in the exports file, we should also map it to an IP address in the /etc/hosts file. Update your hosts file accordingly. You should now be able to use App Designer, Data Mover, and all other two-tier PeopleTools client tools. The next time you shutdown your database guest, you can remove the system.vdi SATA device from the list of storage devices. You can find the steps for configuring the App, Batch, and Web server here.